Then, if you’re looking for some party favours, consider these fish‐in‐a‐bag soap! I imagine the soap can be used by just cutting and peeling the bag off. And when the soap is all used up one gets a little fish! :D I love soap that comes with toys! How‐to on Little Birdie Secrets. 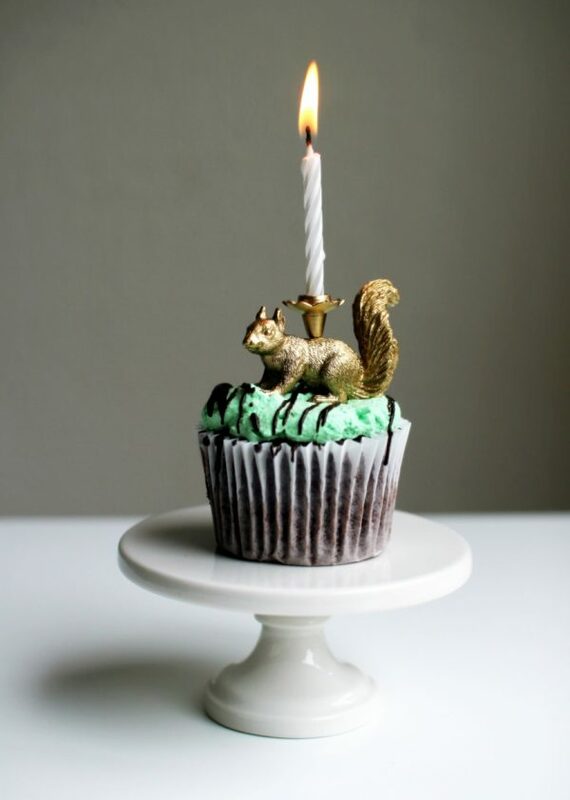 More party ideas — why not bring in some party animals, bearing candles? Instruction on The Sweetest Occasion. Since we’re thinking about going back to school / work busyness maybe it’s also a good time to plan some Christmas crafting. 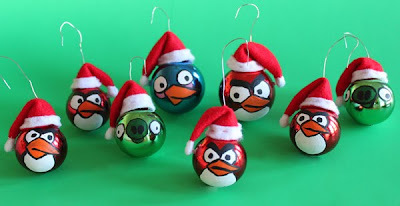 I so hope that this year my tree will be filled with Angry Birds. Even a few green pigs. Brilliantly simple to make with ready‐made ornament orbs, from Obsessively Stitching. 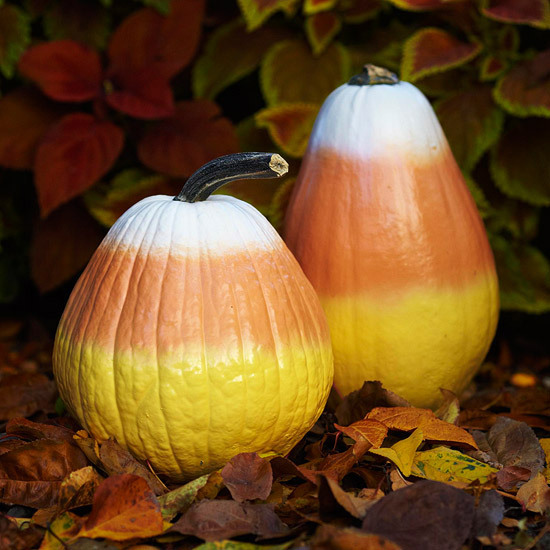 But maybe before we fast‐forward too much to Christmas we can look forward to fall… I’d take these candy corn pumpkin over the carved ones any day. From Better Homes and Gardens. Okra has got to be one of my least favourite foods (just can’t deal with the slime :S), but look at the beautiful imprints it makes! From Bloesem Kids. Oooh, nifty! Knitting with a comb! Instruction on Cut Out and Keep. Love this basketweave pattern, lovely on a belt. Pattern on ChiCrochet. Turn a plain old tee into stylish empire waist blouse. I’ve attempted something similar before but I kind of just pieced things together — I’d love to try it with this very easy to follow nifty diagram. From Guaya. This is very clever. Perfect to place by the door with keys and things. Spotted on Pinterest. Another clever use of a common object! What a great way to start a seedling, then the whole pot can be planted into the ground — no waste! From My Roman Apartment. I’ve been contemplating attempting a bird nest necklace for a while. I’ve come across quite a few tutorials but this one I like a lot. Unfortunately the photo is small but I hope you can see — the wire is actually very nest‐like and messy, I think it’s the best part! From EEBeads. 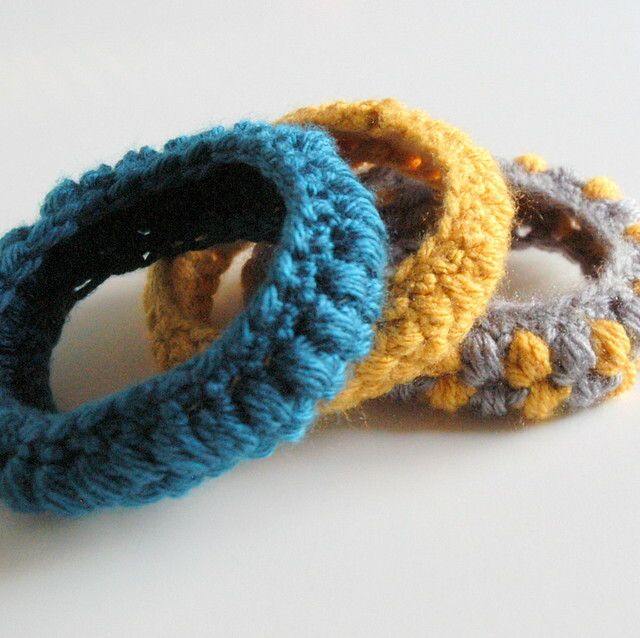 These are some awesome‐looking bracelets/bangles! Love the grey‐yellow one. Crochet pattern on The Boy Trifecta. If made in red this could be another stylish version of the Kiki headband :D How‐to on Momtastic. Have I told you that I’m a big fan of headbands? Here’s another tutorial for a dainty lace headband. Wouldn’t it look pretty with a big flower on the side too? Hmm… except I can’t put my hair up like that because it’s so straight and slippery… but I’m sure I can find a way to make it work if I ever make one :D From McLaughlin Design. We have a type case and I would love it if one day it turns into a coffee table. Instruction on Craft. Popsicle for breakfast? Yes please! :D Recipe on Janice’s Mash‐up. Ohhhh, such fun ideas! I love the jello, the fish soap, the okra stamp (that slime is just so bad! ), and the bangle bracelet. Just all so fun. Have a super weekend, Trish!